When a film title cements itself in contemporary vernacular, it rises above the pack simply by virtue of being constantly articulated. 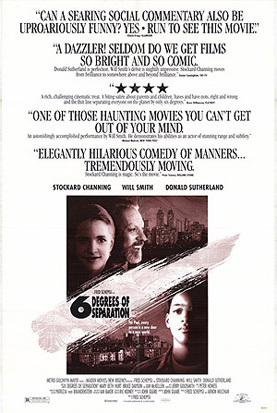 Like Catch-22 before it, Six Degrees of Separation has earned that peculiar distinction. You often hear people talk about the uncanny way they are connected to someone who knows someone else who married someone in another country who, in turn, fancies a friend of their father’s…for instance. It’s an idea that the character of Ouisa Kettredge ponders in one of the more poignant moments of the film after meeting a charming chap who claims he is the son of Sidney Poitier. In his first film role, Will Smith is totally convincing as Paul Poitier. Trouble is, Poitier senior had four daughters – no sons – and when they discover this, Ouisa (Stockard Channing in an Oscar nominated performance) and her wealthy art dealer husband Flan (Donald Sutherland) realise that they have been taken for a monumental ride. Still, connections continue to be made; their colleague, Geoffrey (Ian McKellen) is inspired to mount a South African Film Festival and invite every black artist he’s ever heard about – even Diana Ross. His wife, he claims, once went fishing with her. Then Flan is slipped a card with a contact that gets him and Ouisa into the Sistine Chapel which is closed to the rest of the public for restoration work. Ouisa even manages to slap the hand of Michelangelo’s God in a wild gesture that will resonate loudly, forcing her to review her encounter with the mischievous Paul in a much less sinister light. Directed by Melbourne-born Fred Schepsi and shot by fellow Melbournian Ian Baker, the film is an examination of fate and the gulf between rich and poor. It was adapted from a stage play (in which Channing also starred) written by John Guare, based the true story of one David Hampton who tricked several wealthy New Yorkers into believing he was indeed the kid of Sid. Call it performance art or schizophrenia, Hampton shook up certain members of high society and made them question their relationships with each other and with their offspring. He died of AIDS in 2003 but his tale is immortalised in this film and in those degrees of separation now embedded in our vocabulary.